A few weeks ago, filmmaker George Romero passed away in Toronto. Across the city and elsewhere, remembrance vigils were held for him. It was the kind of treatment usually reserved for great musicians, artists who bared some cardinal human aspect in their work that was hitherto unexplored. In the case of Romero, the artistic reflection was a grotesque one, but estimably more profound than most people realized. People have called him the father of the modern zombie movie, and deservedly. His innovations in the genre formed the most iconic prototype of the undead walker. A similar version is still featured in shows like The Walking Dead (set to return for its eight season in October), which presides somewhere near the crown of modern broadcasting success stories. The popularity of the genre has reached its crest in the 2000s, and has become more pervasive than its progenitors could have ever predicted. Much of the credit for this must surely go to Mr. Romero. One wonders how long this crest can last. There is a visceral fatigue that now hangs over the genre, almost like the enervation suffered by embattled characters in zombie films. Many people now avoid the genre as determinedly they would the creature itself. Their show of disgust is an instinctive response to the zombie’s core significance. It was never a charismatic monster; that was never the point of it. “You can’t really get angry at them,” Romero once said in an interview. “They have no hidden agendas, they are what they are.” A monster with no agenda, no mystery and no vitality doesn’t inspire heroism in its human counterparts. On the contrary, in most dramatic zombie films, it seems to bring out the most wretched, the most subcultural human impulses. Eventually, the difference between the human and the zombie begins to disappear entirely. And that, of course, is the point. By Romero’s own admission, the zombie has always been a flexible tool for representation. His films were handy commentaries on the indulgences of western appetites. With Dawn of the Dead for instance, Romero appeared to portray the avarices of fast-food society. But even the director’s own interpretations of the zombie were wanting; decades later, the commodification of appetite is far too limited a reading to explain the staggering box office dollars and television ratings. So for anyone who has wondered more recently (perhaps with some exasperation) why the zombie has flourished in ways unprecedented, we have this to offer: the zombie has emerged as a symbol for a modern crisis in meaning. And with great respect to the late Romero, neither consumerism nor capitalism will suffice to explain it. Much like the superhero genre now in renaissance, the zombie’s popularity has seemed to emerge from the core motifs of the genre rather than any particular rendering. It is a bloodied sculpture of the modern man; something about speaks of us, to us, at this moment in time. The meaning and origins of these motifs is the subject of the authors’ new book, Zombies in Western Culture: A Twenty-First Century Crisis. While some may balk at the idea, we have proposed that the modern monster emerges from religious diminution: from the declining influence of Christianity, and the malnourished state of spirituality in modern western life. These discontents have spilled outward into our economies: into social and political arenas, relations between individuals, into the systems charged with cohering life’s many meanings. The zombie represents a breakdown of these systems. Romero’s films were among the first to bring it into focus. It’s not exactly ‘evil’ that Romero is describing here. It’s more like an ailment. It has taken us an entire book to describe what the monster, and the crisis, really is. But he is certainly right about the rest: the monster is not lurking in the distance. The crisis is upon us, and inside us. And as with any ailment, the first step is just to diagnose it. 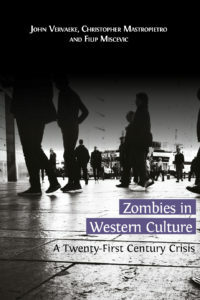 Read Zombies in Western Culture: A Twenty-First Century Crisis for free online. This entry was posted in Author Posts, Uncategorised. Bookmark the permalink.